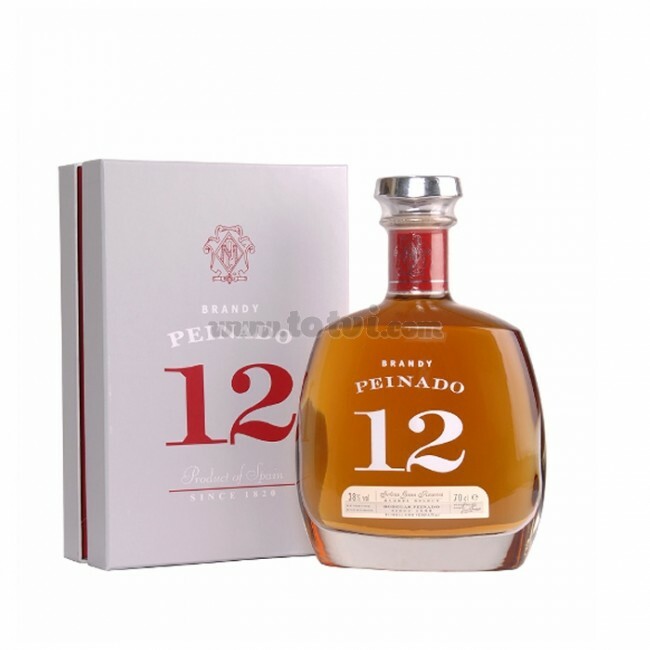 Peinado 20 years is a brandy Solera Gran Reserva produced in Tomelloso that was born in 1820. It combines tradition and quality in harmony. It is a brandy made with wine spirits of alcoholic graduation inferior to 70ºC, called holandas. It is round, smooth and complex. Peinado 20 years is a brandy solera Gran Reserva. Mahogany color. In nose they emphasize aromas of nuts almonds, complex and highly evolved. Very nice. While in the mouth is a brandy round, soft and complex. It has an aftertaste with great wealth. For the manufacture of brandy Peinado is used as raw material wine spirits of alcoholic graduation lower than 70ºC, called holandas. The holandas are obtained by the distillation of wines from healthy grapes of the variety aireén. This distillation is carried out in copper alquitaries over low heat. Copper alquitaries act as catalysts for chemical reactions, which give the Dutch their characteristic bouquet. Later these alcoholes are aged by depositing them in American oak boots, previously cured and whose capacity oscillates between 200 and 500 liters. The result of aging for about 20 years the spirits in American oak boots is the Brandy Peinado Solera 20 years. Tomelloso 1820, the Brandy Peinado is born. Of a rigorous selection of wines of the variety Airén, that produces this place of La Mancha, the founders made their first distillation with direct fire, from which they obtained nails of excellent quality and character for their aging. They gave the key of an originality. Sprinkle the tiles not with holandas, but with aged brandy. A practice that has passed the passage of time, and has become essential to offer that aroma and body that confer the unique personality of brandy. Tradition and quality in harmony. Landscapes where Don Quixote and Sancho walked. Brandy Peinado is the pride of a culture agrisolated by history, which keeps the legend alive. It comes with a black case.